Eliminate unwanted odors, and improve the look of any room at the same time. 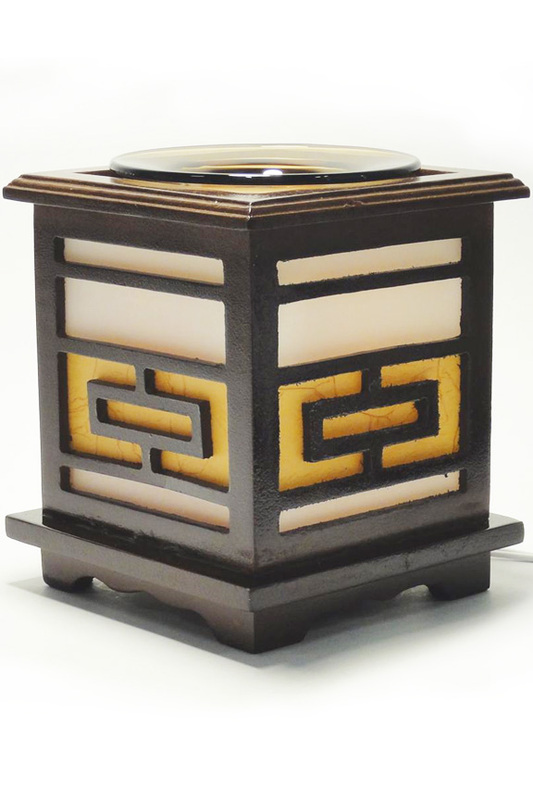 This fragrance lamp features modern styling with intricate detailing, and with the warm glow at the center, it can set the mood in any environment. An all wood frame is backed by a two-tone shade with added texture, and in the middle there's a colorful glass cylinder that's home to the dimmable halogen bulb. Add your favorite essential oil to the dish at the top, or use scented wax instead. Once the lamp begins to heat in from beneath, the fragrance will start to fill the air. Use the controls to set the exact intensity that you prefer, and enjoy the fresh scent that's free of toxic ingredients, and doesn't require an aerosol spray to deliver. Just plug it into any standard outlet to set it up, and get started right away because it comes complete with a long lasting bulb, pre-installed. Rectangles are key to the geometric design of this model, and the all wood frame gives it a sleek and simple look that would blend with the décor of almost any room. Behind the darkly colored wood is a multi-colored shade that gives the sides a solid look. Although it's semi-transparent to allow light through, it also has interesting texture and color, so it looks great, even when the unit is turned off. 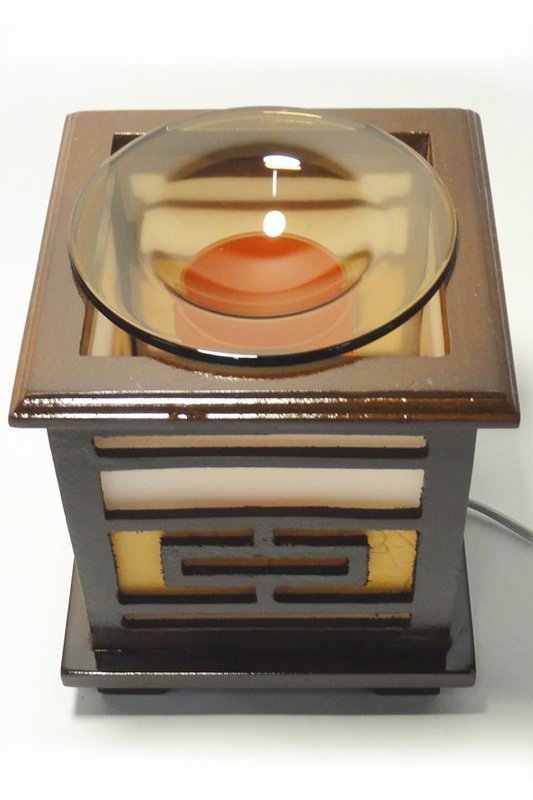 At the center of the lamp, there's a thick, glass cylinder that measures 2.75" in diameter and 3.25" in height. The bulb is in the center, and because the glass is colored, when lit the light is orangish-red in color. The glass cylinder also helps to concentrate generated heat, and direct it upward to the four inch glass dish that rests on top of the lamp. Use it as a dimmable light alone, or fill the dish with a single fragrance oil, a mixture of several, or a solid wax that's scented to take advantage of it's fragrance diffusing abilities. You can adjust the dimmer switch to increase the intensity of the light, and because this increases or decreases the resulting temperature, it will also affect the amount of fragrance that's diffused into the air. Electric - This lamp is powered by electricity for reliable functionality and even heating, so just plug it in to any standard outlet, then flip the switch to turn it on. Once the bulb heats up, any scented oils or wax above it will begin to spread their scent throughout the room. Natural - Diffuse pure essential oil into the air for a truly safe and natural method of eliminating odors and making your home smell great. No harsh chemicals to worry about, and no toxic liquids to coat surfaces like carpets and furniture. Quality - Intricate details and high quality materials combine to create an elegant decoration that is also beneficial. You'll never have to worry about faulty electronics, or flimsy construction because this top quality lamp is guaranteed to look great, work well, and last a long time. Adjustable - A rotating switch turns the light on and off, and you can set it to high, low, or anywhere in-between. Keep it dim to use it at night, or minimize the fragrance, and turn it to high to create a bright glow and a powerful scent. Easy - It's simple to use, and easy to maintain. Just plug it in to make it work, add oil or wax to the top to diffuse the scent, and place the dish in the dishwasher when it gets dirty. The bulb that comes with it will last for a long time, but replacement is quick and painless when it becomes necessary. Versatile - Use it to eliminate stinky smells, or use it as a nightlight thanks to the dimmable bulb. As a light or deodorizer it works well, and when combined the benefit and beauty is amazing. Smokeless - Unlike candles, incense and other options, you don't need an open flame to release the fragrance with this product. The result is a much cleaner process with no smoke, soot, ash or pollution to worry about. 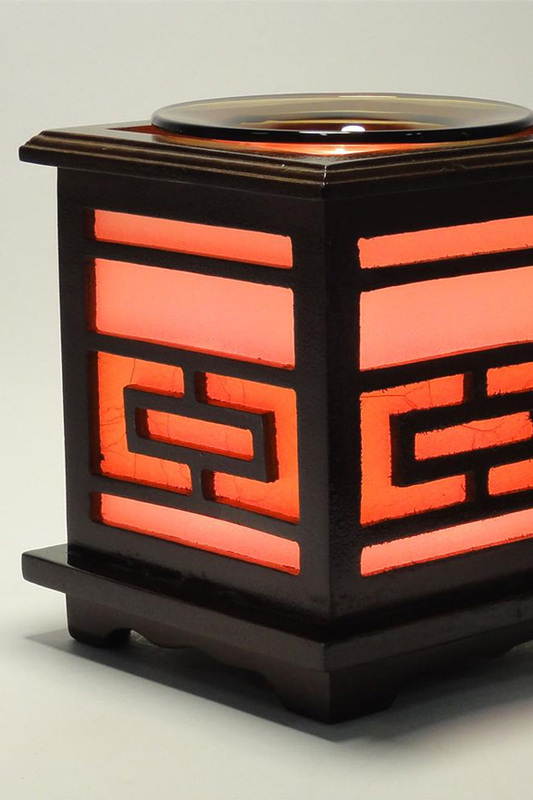 Uses Add a decorative light and warm glow to any location, but also benefit from the ability to heat oil and wax to deodorize in a safe and natural way. Compatibility Use with any scented oil or wax. Controllable Yes. A dimmer switch allows you to have the light barely on or bright and intense depending on your needs. A modern geometric design creates a simple and effective focal point. Turn on the warm light to heat your favorite oil and diffuse the fragrance into he air.Order Yours Today!